i love everything about September – but, sartorial matters aside, it's the back-to-school stationery that gets me every season. confession: i've always been a pen and paper person. for me, there's something unique and invaluable about the habit of writing things down, and crossing items off a list. i've been a loyal Moleskiner for some time, and i had been using their weekly notebook as a planner for years. however, recently it started to feel a bit too limiting in terms of space and layout. i wanted a more fluid layout and more customized, adaptable features. so after doing some research into the planner options out there, i got a Filofax. form + function: i've been using mine for a little over a month now, and it's fantastic. the six-ring binder allows for adding or subtracting inserts/sections as needed, and the leather folio design gives me just enough space to stash important receipts, business cards, and other necessary papers all in one place. leather + paper quality: i really like that the leather is thick, sturdily stitched, and nice to look at. good quality paper as well. best of all, i am noticeably more organized and more productive with this new planner system after only 5 weeks. the verdict? my Filofax has become an indispensable everyday essential. if you're looking for a more 'agile' planner with excellent customizable features, i'd highly recommend it. yes, it is pricier than your typical bookbound or spiral-notebook organizer, but the innumerable benefits of a well organized life make it very much worth it. P.S. 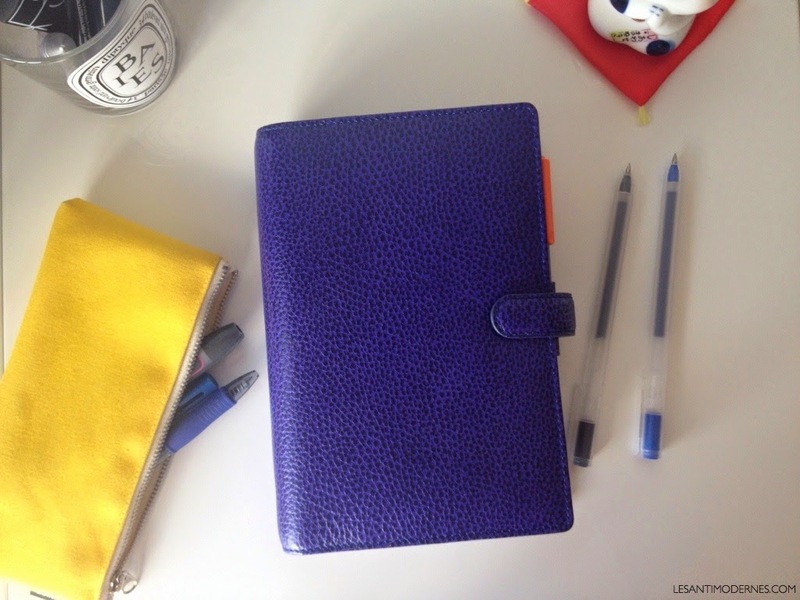 Maja also wrote about her Filofax recently, and Angela at paper lovestory has some lovely posts about all things stationery. do you use a digital or analog planner? what's your method for staying organized? Ha! I was just telling Maja Huse that I ordered a planner a few weeks ago. I wonder if the "Planner Reveals" are going to making the rounds on the blogosphere :-) I've always kept my notes/dates in a little notebook but somehow, a larger size planner seems at once more grown-up and actually makes me want to work! there are some quirky corners of the interwebs devoted to stationery / planners, but if it works for you, run with it right? any method/system that makes you more productive is a good thing in my book. You've given me a new obsession! I've been using a modified moleskin (drew my own week-at-a-glance pages and monthly calendar pages), but the grass is always greener, right? I love stationery, but as far as organising my life is concerned, I am strictly digital - dependent on my blackberry and iPad. The fact that all my lists sync with my email accounts makes it very easy to keep track of stuff. I use Pocket Expense to monitor my spending. Ultimately though, nothing helps my productivity as much as a yoga routine, a good night's sleep and a deadline! i'm the paper version of you :) - yoga and a good daily working schedule do wonders for me. After Maja's post I was convinced I needed one of these, but then, out of sight out of mind, and since my laziness prevented me from acting on it right away, I managed to ignore the impulse until it was forgotten. And now this! You ladies are killing me. Because now I am overwhelmed with the idea that I need one immediately and have to totally overhaul my whole organizational methodology. Obsessed. Thanks. Ha ha. You guys are killing me. we must have gotten ours around the same time. i haven't used a proper planner since high school, so there was definitely a moment of 'really??'. but so glad i gave this a try! I'm envious! Earlier this month I contemplated a return to paper and longed for the days when life was much simpler. Alas - I need to keep track of my schedule, my husband's schedule, and two kids. I also work virtually and all of my appointments that are scheduled within our virtual system (so that everyone else who works for me is able to see) are synced with ical and all of my devices .. and we're able to share family calendars that way as well. It definitely isn't as glamorous, but I think I have to stay digital otherwise I might lose my mind. I do, however, keep a moleskin notebook with me at all times to record lists, to-do's, notes from conversations and meetings. Sigh - I miss paper. Enjoy the simplicity while you have it! paper is wonderful. i find it really nice to have a reprieve from screens! yeah for some reason the idea of putting all my personal business on my phone never appealed to me. moleskine makes great plain / notebooks though - i still have a few for writing, sketching and such.